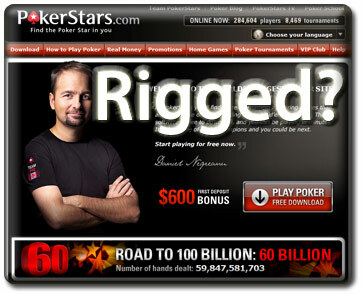 "Pokerstars is rigged" is a common complaint that you will hear among online poker players. Some of it comes from the frustration of losing on the site, while others truly believe that the site is somehow programmed to take their money. Unfortunately, the history of online poker is marred with examples of sites or players that have used underhanded methods to steal money from players. As such, today we are going to look at whether Pokerstars.com is rigged. The number one complaint that you will hear from the conspiracy theorists that claim that Pokerstars is rigged is that the random number generator, also known as the program that deals the cards, is flawed. They say that it is inferior technology and is predictable. To break down the Pokerstars shuffle, two sources of data are used to help to create a random shuffle. First, user input is collected and store from the client software. This includes mouse movements, event timing, etc. Then data is gathered from Quantis  a hardware random number generator created by ID Quantique. They then take 249 random bits from both sources to achieve an unpredictable stat distribution. Then a SHA-1 cryptographic hash to mix the data to add security. Then a series of algorithms are used to complete the shuffle and deal. The complete details can be found on Pokerstars Security site, but suffice it to say that the random number generator is highly complex. In addition, the shuffler has been verified by Cigital to be valid after Pokerstars released their source code to be audited by them. Think about a live poker player’s playing experience. They play at one table for about 8 to 10 hour a day. In those hours, they may see 40 hands per hour at the most. Granted, this is a generous estimate, but it is made to make a point. If this player plays 300 days a year for 10 hours a day and 40 hands per hour, they will play 400 hands per day, 12,000 hands in 30 days, and 120,000 hands in a year. A typical online player sees about 80 to 100 hands per hour. Take the same player, playing the same amount of time and seeing 80 hands per hour, they will see 240,000 hands per year. That is twice as many hands. Many players play two tables or more at a time. If a player plays four tables, they can see nearly 1,000,000 hands a year. That is nearly 10 times the number of hands as another player. Now, multiply that by the number of tables on a site. At the time that I wrote this article, there are 23,774 tables in play. At 80 hands per hour, that is 1.9 Million hands per hour. As such, you are going to see many more situations and scenarios unfold. Simply put, the reason you see so many more bad beats online is because there are so many more hands. An older player will tell you that they have seen it all in the course of their lifetime. For online players, they can sometimes get the equivalent of a lifetime of experience in a year’s time. Online poker is poker on steroids, so be prepared for a wild ride. If you want to know the ramification of running a crooked poker site, look at what happened with Ultimate Bet and Absolute Poker. Thanks to the superuser scandal masterminded by Russ Hamilton, both sites were forced to pay Millions back to their players. In addition, the reputation of both the sites and any pros associated with the sties are ruined forever. Russ Hamilton is all but officially blackballed from live poker and has not been seen in a major poker setting for years. Would Pokerstars, and specifically their pros, risk that. Think about it. Daniel Negreanu and Barry Greenstein are two of the more popular live pros that play on the site. If the site were not on the up and up, both of them would basically be putting their name and their careers at risk. Greenstein has more to lose in reputation as his poker playing has resulted in a lot of good for charity. Imagine the impact on him and the damage to the charities he is involved with if Pokerstars were indeed crooked. Finally, they are they largest site in the world. If they were crooked, the backlash and repayment would cripple, if not kill the company. Ultimate Bet had to rebrand as UB to try and stay afloat and their traffic is nowhere near its past levels. In addition, they are constantly under scrutiny for anything that even hints at being wrong at the site. In poker, once you are deemed a cheat, you are essentially through as a player. Pokerstars will not risk that. In short, if you hear of someone saying Pokerstars is rigged, find out their reasoning behind their claims. Chances are they took a bad beat and are steaming from the beat. Many players think they are the best and that they cannot possibly lose. When they do, someone must be cheating. Pokerstars is in the business to make money, and running an honest site is the best way to do so. If others refuse to believe that, let them. There are plenty of other sites out there they can play at while you grow your roll at Pokerstars. Want ot learn more about Pokerstars? Then read our PokerStars Review that was recently updated in April 2011.